Little is known about human parechovirus (HPeV) infection in Thailand. The genotype distribution of HPeV strains in children admitted to hospitals with acute gastroenteritis was investigated using polymerase chain reaction (PCR) and nucleotide sequencing of the VP1 region as the detection and genotype identification methods, respectively. Of a total of 2,002 stool samples, 49 (2.4%) were positive for HPeV. Of these, HPeV-1 was the most predominant genotype (40.8%), followed by HPeV-3 (16.3%) and HPeV-14 (16.3%), while HPeV-5, -6, -2, -4, and -8 strains were less frequently detected, at 10.2%, 8.2%, 2%, 2%, and 2%, respectively. HPeV infections were detected throughout the year with the biannual peaks of infection in the rainy (Jun-Jul-Aug) and winter (Nov-Dec-Jan) months in Thailand. Based on VP1 amino acid sequence alignment, the arginyl-glycyl-aspartic acid (RGD) motif was found in HPeV-1, -2, -4, and -6 strains. Additionally, an amino acid insertion at the N-terminus of VP1 was observed in HPeV-4 and HPeV-5 strains. Phylogenetic analysis revealed that small clades of HPeV-1 and HPeV-3 strains emerged in 2016 and 2015, respectively, and dominated in the year of their emergence. 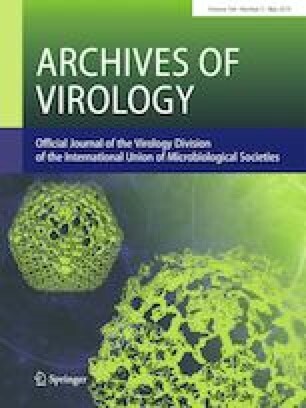 The HPeV strains detected in Thailand in this study were most closely related to reference strains from Asia and Europe. The evolutionary rate of HPeV strains was 2.87 × 10−4 (95% highest posterior density (HPD) 0.10-6.14 × 10−4) substitutions/site/year. These findings provide information about the genetic diversity and evolutionary dynamics of HPeV genotypes circulating in pediatric patients with acute gastroenteritis in Thailand. The online version of this article ( https://doi.org/10.1007/s00705-019-04249-2) contains supplementary material, which is available to authorized users. This research was supported by the Center of Excellence in Emerging and Re-emerging Diarrheal Viruses (Grant number CoE2560) and a post-doctoral fellowship in 2017 from Chiang Mai University, Chiang Mai, Thailand. The study was conducted with the approval of the Ethical Committee for Human Rights Related to Human Experimentation, Faculty of Medicine, Chiang Mai University (MIC-11-04-20-14-328).